Editorial: Do we really need more research? Purpose: To compare planning and patient rehabilitation using a 3D dental planning software and dedicated surgical guides with conventional rehabilitation of partially or fully edentulous patients using flapless or mini-flap procedures and immediate loading. Materials and methods: Fifty-one fully or partially edentulous patients requiring at least 2 implants to be restored with a single prosthesis, having at least 7 mm of bone height and 4 mm in bone width, had their implant rehabilitation planned on three-dimensional (3D) cone beam computed tomography (CBCT) scans using a dedicated software. Afterwards they were randomised according to a parallel group study design into two arms: computer-guided implant placement aided with templates (computer-guided group) versus conventional implant placement without templates (conventional group) in three different centres. Implants were to be placed flapless and loaded immediately; if inserted with a torque over 35 Ncm with reinforced provisional prostheses, then replaced, after 4 months, by definitive prostheses. Outcome measures, assessed by masked assessors were: prosthesis and implant failures, complications, peri-implant bone level changes, number of treatment sessions, duration of treatment, post-surgical pain and swelling, consumption of pain killers, treatment time, time required to solve complications, additional treatment cost, patient satisfaction. Patients were followed up to 1 year after loading. Results: Twenty-six patients were randomised to the conventional treatment and 25 to computerguided rehabilitation. No patient dropped out. One provisional prosthesis failed, since one of the two supporting implants failed 11 days after implantation in the conventional group (P = 1.0). Four patients of the conventionally loaded groups experienced one complication each, versus five patients (6 complications) in the computer-guided group (P = 0.726). There were no statistically significant differences between the two groups for any of the tested outcomes with the exception of more postoperative surgical pain (P = 0.002) and swelling (P = 0.024) at conventionally treated patients. Conclusions: When treatment planning was made on 3D CBTC scan using a dedicated software, no statistically significant differences were observed between computer-guided and a free-hand rehabilitations, with the exception of more postoperative pain and swelling at sites treated freehand because more frequently flaps were elevated. Conflict of interest statement: This trial was completely self-funded and there are no conflicts of interests. Guljé, Felix L. / Raghoebar, Gerry M. / Vissink, Arjan / Meijer, Henny J. A. Purpose: The aim of this randomised controlled trial was to assess the clinical performance of single crowns in the posterior maxilla supported by either 6-mm or 11-mm implants combined with maxillary sinus floor elevation. Materials and methods: 41 consecutive patients with one missing premolar or molar in the posterior maxilla and with an estimated bone height of 6 to 8 mm in that area were included. Each patient was randomly allocated to one of the two treatment groups, namely to receive an 11-mm implant (OsseoSpeed 4.0S, Dentsply Implants, Mölndal, Sweden) in combination with maxillary sinus floor elevation surgery or to receive a 6-mm implant (OsseoSpeed 4.0S) without any grafting. After a 3-month osseointegration period, all implants were restored with custom-made titanium abutments and cemented zirconia-based porcelain crowns. Outcome measures were: implant survival; radiographic bone changes; plaque accumulation; bleeding tendency; peri-implant inflammation; presence of dental calculus; biological and technical complications; and patients' satisfaction. Clinical and radiographic examinations were performed at placement of the crown and 12 months thereafter. Patients' satisfaction was scored before treatment and after 12 months of functioning of the crown. Results: One patient of the 11 mm implant group died during the follow-up. No implant failed and no biological or technical complications occurred. From loading to the 12 months follow-up, no difference was found in mean marginal bone changes between the groups (bone resorption in both groups 0.1 ± 0.3 mm). Clinical items revealed very healthy peri-implant soft tissues in both groups. Patients' satisfaction scores were high in both groups. Conclusions: 6-mm implants and 11-mm implants combined with sinus floor elevation surgery are equally successful to support a single crown in the resorbed posterior maxilla after 1-year follow-up. Conflict of interest and sources of funding statement: This two-centre study has been partially sponsored by Dentsply Implants. None of the authors have economical interest in the product related in this study or in the company. Purpose: To compare the clinical outcome of platform switching (PS) and regular platform (RP) implants in bilateral single molar replacements. Material and methods: This study was designed as a randomised, controlled, split-mouth trial. Eighteen patients, with bilaterally missing single molars had one site randomly assigned to a PS implant or a RP implant. A total of 36 implants were bilaterally installed. Both implants were loaded with screw retained temporary crowns 3 months after implant insertion and with screw retained definitive crowns 3 months later. Outcome measures were implant/crown failure, complications, radiographic marginal bone-level changes, pocket probing depth (PPD) and bleeding on probing (BOP). Clinical data were collected at baseline 6 and 12 months after implant placement. Results: No patients dropped out and no implant failed. No prosthetic or major biological complications were observed. One year after implant placement, mean marginal bone level was 0.93 ± 0.26 mm (95% CI 0.81 to 1.05) in RP group and 0.84 ± 0.23 mm (95% CI 0.73 to 0.95) in the PS group and no statistically significant differences between the two groups were observed (P = 0.18). Mean PPD and BOP values were, 6 and 12 months after implant placement, 2.74 ± 0.49 mm (95% CI 2.51 to 2.97) and 1.28 ± 0.75 (95% CI 0.93 to 1.63) in the RP group, and 2.70 ± 0.38 mm (95% CI 2.53 to 2.88) and 1.39 ± 0.78 (95% CI 1.03 to 1.75) in the PS group respectively, with no statistical differences between groups (P = 0.81 and P = 0.16, respectively). Conclusions: No statistically significant difference was observed between platform switched and non-platform switched implants. Conflict of interest statement: This study was not supported by any company and there is no conflict of interest. Purpose: To report retrospectively on the 5-year follow-up results of the rehabilitation of complete edentulous atrophied maxillae, using extra-maxillary zygomatic implants alone or in combination with conventional implants. Materials and methods: This retrospective report includes an initial cohort of 39 patients (30 women and 9 men), with a mean age of 53 years, followed for 5 years. The patients were rehabilitated with 39 fixed prostheses and 169 implants (92 zygomatic implants inserted extra-maxillary and 77 conventional dental implants). A provisional prosthesis was manufactured and attached via multiunit abutments secured to the implants on the same day as implant placement. According to patient desires and each clinical situation, either an acrylic resin, a metal-acrylic or metal-ceramic final prosthesis was inserted approximately 6 months after implant placement. Outcome measures were: prosthesis success; implant success; complications; probing pocket depths; marginal bleeding; and marginal bone levels (only for conventional implants). Data were analysed with descriptive statistics. Results: Two patients died after 8 and 30 months of follow-up due to causes unrelated to their oral rehabilitations, and 5 patients dropped out of the study. No prosthesis was lost; one zygomatic implant was removed after 46 months of follow-up, giving cumulative success rates of 97% and 98.8% (patient and implant related, respectively). Twelve complications occurred in 12 patients: 5 sinus infections in 5 patients, all with a previous history of sinusitis and whose sinus membrane was disrupted during surgery; one oroantral communication (leading to removal of the implant), 2 all acrylic resin prostheses fractures, 1 ceramic crown fracture (on a metal-ceramic prosthesis); and 3 screw loosenings. Bleeding on probing was recorded in 6 patients (13 implants). Probing pocket depths >4 mm were present in 13 patients (23 implants) at 5 years of follow-up. The average (standard deviation) marginal bone loss on conventional implants was 1.16 mm (0.77 mm) in those 9 patients having the intraoral radiographs. Conclusions: The long term outcome (5 years) of rehabilitations performed on patients with completely edentulous, severely atrophic maxillae supported by immediately loaded zygomatic implants alone, or in combination with conventional implants, is satisfactory. Conflict of interest statement: Professor Maló is currently a consultant for Nobel Biocare. This study was not supported by any grant. Purpose: The aim of the present study was to describe nerve fibres around osseointegrated implants in humans. Materials and methods: Twelve mechanically failed implants, retrieved from 10 patients were collected from three dental centres over a period of 5 years. After implant removal, decalcified semi-thin sections (0.5 μm) were stained with thionic methylene blue for light microscopic analysis. In addition, an ultrastructural analysis was performed on serial ultra-thin sections (0.06 μm) using transmission electron microscopy. Results: Both myelinated and unmyelinated nerve fibres could be identified inside the Haversian canals of the osteonal bone near the implant threads. Myelinated fibres were also located at the woven bone around the implant. However, no differentiated nerve endings could be observed around the implants. Conclusions: This study shows the presence of nerve fibres in human peri-implant bone. Previous studies in animals showed that those fibres participate in the process of bone modelling and remodelling. Yet, the role of peri-implant bone innervation in the osseoperception phenomenon cannot be ruled out since the mechanism of mechanoreception in bone is not fully understood. Purpose: To report the 5-year outcome of immediately loaded dental implants in patients with untreated periodontal disease. 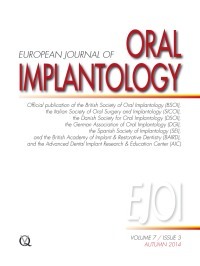 Materials and methods: This prospective cohort study included 103 consecutive patients (51 females and 52 males) with an average age of 52 years (range: 22 to 80 years) who were rehabilitated with 380 implants supporting 145 prostheses in both jaws (40 single; 33 partial and 72 complete rehabilitations). The implants were inserted in patients with active and untreated periodontitis. The patients did not receive any previous periodontal treatment before implant surgery, except for an oral hygiene session immediately before the implant surgery. In maintenance (every 6 months) patients received periodontal treatment as needed. Outcome measures were: prostheses failures; implant failures; complications; and marginal bone level changes. Results: Fifteen patients dropped out of the study (14.6%). Two patients lost two implants (FDI positions nos.12 and 42), rendering a cumulative survival rate of 97.9% and 99.4% at 5 years of followup using the patient and implant as unit of analysis, respectively. The average (standard deviation) marginal bone resorption was 0.71 mm (0.42 mm) at 5 years. Mechanical complications occurred in 14 patients, consisting of prostheses fractures (10 provisional prostheses and 4 definitive prostheses). Thirteen implants (3.9%) in 13 patients (14.8%) presented peri-implant pathology. Conclusions: Within the limitations of this study, it is possible to conclude that the rehabilitation of patients with untreated periodontitis using immediately loaded dental implants is feasible in the medium-term, when periodontal therapy is provided after rehabilitation and the patients are regularly maintained. Conflict of interest statement: This study was supported by a grant from Nobel Biocare Services (grant no. 2012-1099).